Mel Brooks has done it again with this hilarious send-up of all things Dracula. Following the classic premise set by Universal and Bram Stoker, Leslie Nielsen stars as a decidedly goofy Dracula in pursuit of blood, women and comedy. Having arrived in London, Dracula has spotted the woman to serve by his side for all eternity. 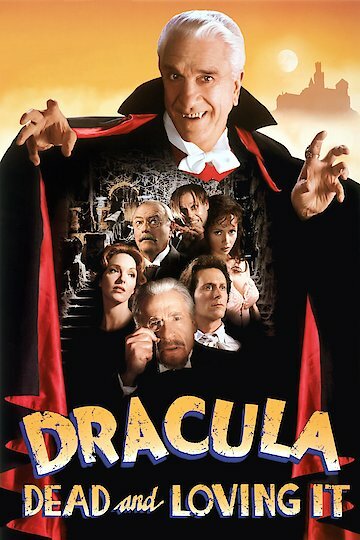 Dr. Seward (Harvey Korman) and Jonathan Harker (Steven Weber) must save the fair and helpless Mina (Amy Yasbeck) from being changed into a vampire by Dracula and his minion Renfield (Peter MacNicol). Aided by Dr. Van Helsing (Brooks) will they save her in time? Dracula: Dead and Loving It is currently available to watch free on Vudu Free and stream, download, buy on demand at Amazon, Vudu, FandangoNow, iTunes, YouTube VOD online.